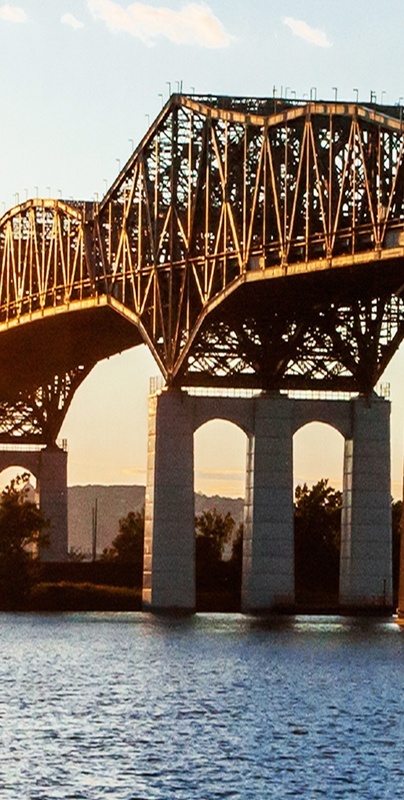 The Champlain Bridge is managed, operated and maintained by the Jacques Cartier and Champlain Bridges Incorporated (JCCBI), a crown corporation reporting to Infrastructure Canada. Since 1962, the Champlain Bridge has been one of Canada’s busiest bridges. Today, the Bridge carries on average over 160,000 vehicle crossings every day. Spanning the Saint Lawrence River between Montreal Island and the river’s south shore, the Champlain Bridge is a vital link in the regional and Canadian economy and essential to the movement of goods and people in one of Canada’s most densely-populated urban areas. After over 50 years of service, the Champlain Bridge was showing signs of aging, with apparent deterioration in critical elements of the structure.The Bridge was constructed with laterally post-tensioned prefabricated beams and cast-in-place deck panels that made gradual replacement of the deck impossible. As the bridge now nears the end of its service life, a new bridge is scheduled to replace it in the next decade. It was therefore necessary for the JCCBI to ensure the existing structure would remain safe until the end of its useful life. Since its completion in 1962, the Champlain Bridge had been re-paved four times, however no other significant repairs were ever performed. 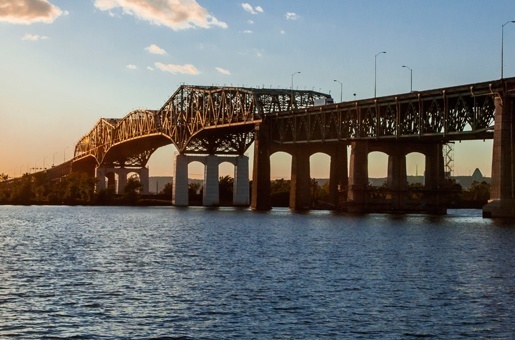 With the announcement of a new bridge to be built to replace the aging Champlain Bridge, SIMCO was hired to determine if the old bridge deck could be serviceable for the next ten years until completion of the new bridge. SIMCO’s scope of work was to identify exposure conditions affecting the structure, determine the current condition of the 50-year-old bridge deck, and provide recommendations as to the repairs and maintenance required to ensure its safety and serviceability for another 10 years. SIMCO used information on exposure conditions collected across the deck and concrete properties measured at representative locations to perform comprehensive analyses using SIMCO’s STADIUM® numerical simulation tool. Results showed that despite minor surface degradation in some of the areas, the concrete deck was generally of good quality and resistant to moisture movements and chloride ingress. The concrete deck was generally well protected by the asphalt paving over the years, as shown by the good concrete condition and low chloride levels. Surface damage and high chloride concentrations were observed only in localized areas, where the pavement failed to protect the concrete. These areas tend to be located near the joints or edges of the roadway. The results of the analysis carried out by SIMCO have shown that, provided the pavement is well-maintained and required local repairs are performed, the bridge deck should not exhibit generalized corrosion problems until the new bridge is built, within the next 10 to 20 years. SIMCO provided the JCCBI with recommendations as to the interventions required to maintain the bridge deck for the last stretch of its service-life. SIMCO’s analysis results will also be used to establish durability specifications for the design of the new bridge.